Leaving behind family to embark on a work trip is never easy — especially when you've got a daughter you like to call Tatertot waiting anxiously for you to come home. According to Reddit, where a photo of the note was originally posted, Tate is actually a nine-year-old in 4th grade (with the reading level of a sixth grader, her father proudly shares). When you think about the importance a stuffed animal plays into a child's life, Tatertot is actually making a big sacrifice by offering up what is surely a beloved toy to give her dad company on his travels. 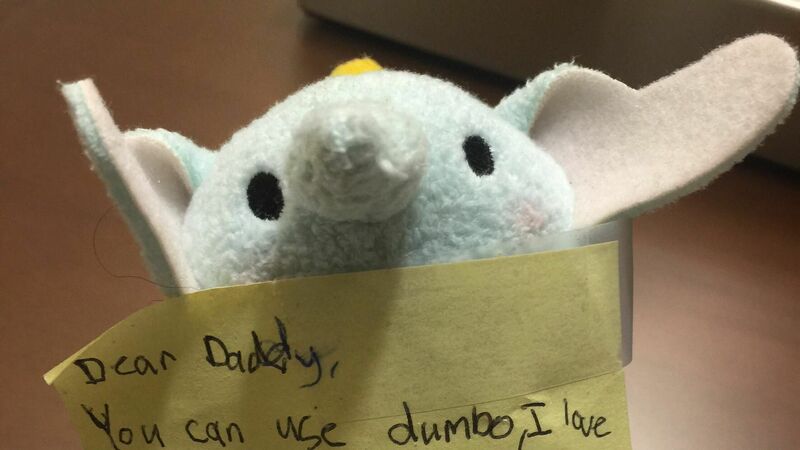 Of course, her father rewarded her Dumbo rental with a friend for the toy elephant: a stuffed I <3 New York teddy bear. Well done, dad and daughter.